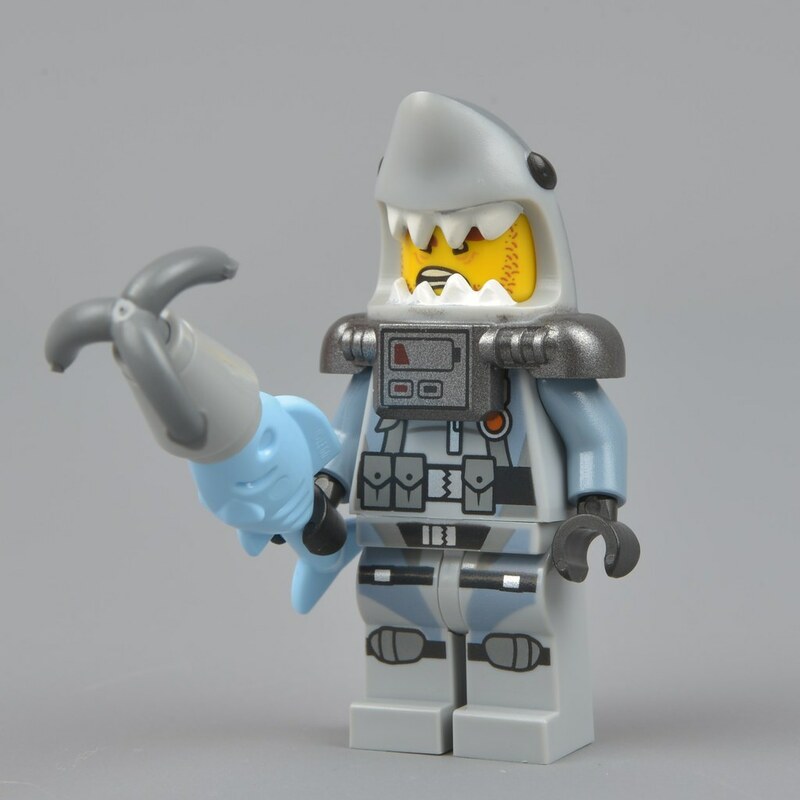 Many young kids have grown attached to NINJAGO, and LEGO has noticed enough to produce a single Juniors set for The LEGO NINJAGO Movie in 10739 Shark Attack. While the price-per-part ratio is fairly lackluster, as is common with the Juniors line, there seems to be a lot to like about this set. With three minifigures (one of which being exclusive) and multiple models for the low price point of $19.99 or 19.99€, it is hard to turn down at first glance. Furthermore, the set appears to go together nicely with the rest of the normal product range - particularly, 70606 Spinjitzu Training (recently reviewed here). In that regard, I hope to be pleasantly surprised. Lloyd began his role in NINJAGO in 2012 as a young, immature boy looking to follow in his evil father Garmadon's footsteps, before discovering his destiny as the Green Ninja a bit later on. In the movie universe, Lloyd appears to already start as a ninja and trains alongside his five high school friends with Master Wu in order defeat his father. This minifigure depicts the training gi Lloyd practices his Spinjitzu skills in. It is all white, with some black and gold highlights. A part of me wishes he had something more unique like a green lining, rather than be identical to the other ninjas' training gis included throughout the other sets. 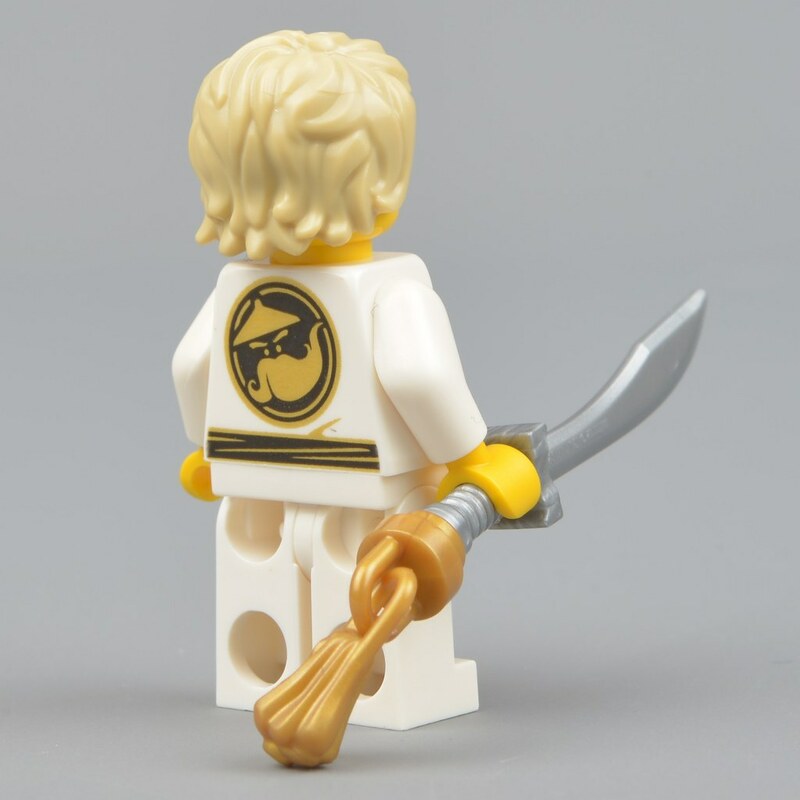 Lloyd's right leg includes the word 'ninja' in the NINJAGO script, which is logical. The iconic WU-CRU symbol exists as his back printing. He is complete with angry and determined expressions, and a blond hairpiece which is rather appealing and could potentially be used in brown for Anakin Skywalker. The Chosen One is armed with the new dao sword mold, tailed by a golden tassel. 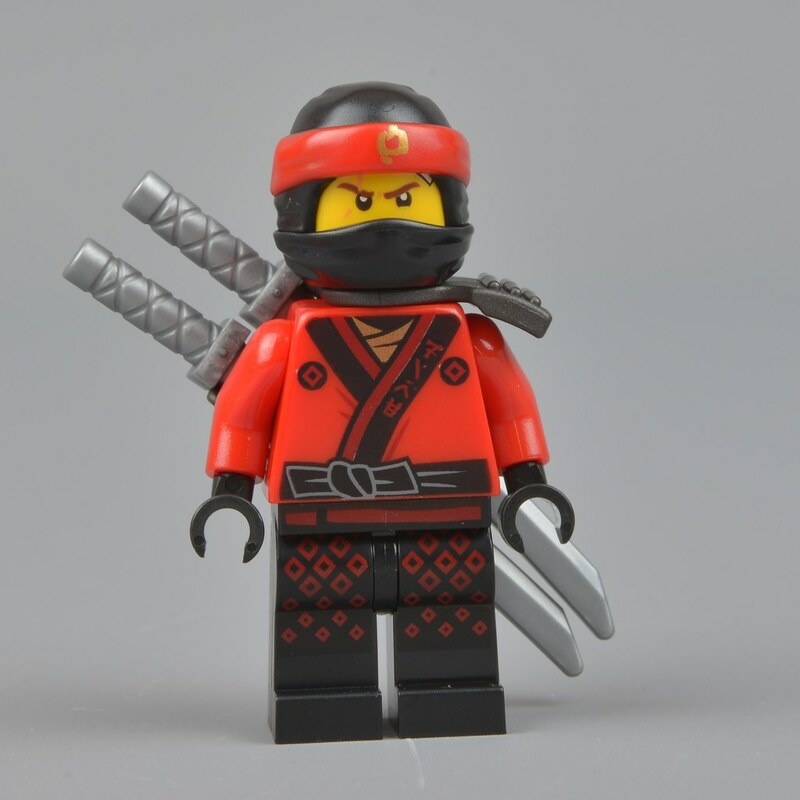 This version of Kai, in full ninja garb, appears in a total of five sets based on The LEGO NINJAGO Movie - therefore being the most common minifigure in the first wave. However way you decide to acquire him, he is an absolute treat. 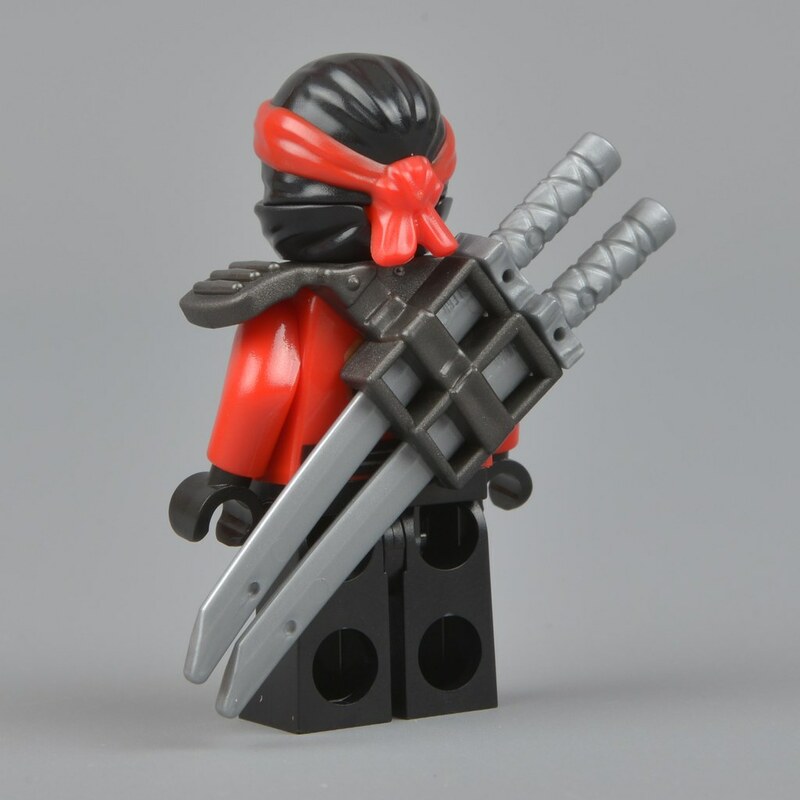 A mix of both red and black is present throughout the minifigure, which offers welcomed contrast. The mask consists of two pieces and is absolutely marvelous, as they slot together perfectly in construction of the minifig and look great. The printing features Kai's new shinobi shozoku for The LEGO NINJAGO Movie, featuring robe printing and the word 'fire' in NINJAGO script. This attention to detail is very pleasing to me, and it is quite fun to look for and translate all of the different phrases within the sets. The legs feature a little bit of red diamond printing against the black. Kai's back printing is the symbol of Wu's team common amongst all six students. Around his neck is a sheath designed to hold two silver katanas. Kai has two expressions on his head - one side angry, and the other a perhaps overdone grin! 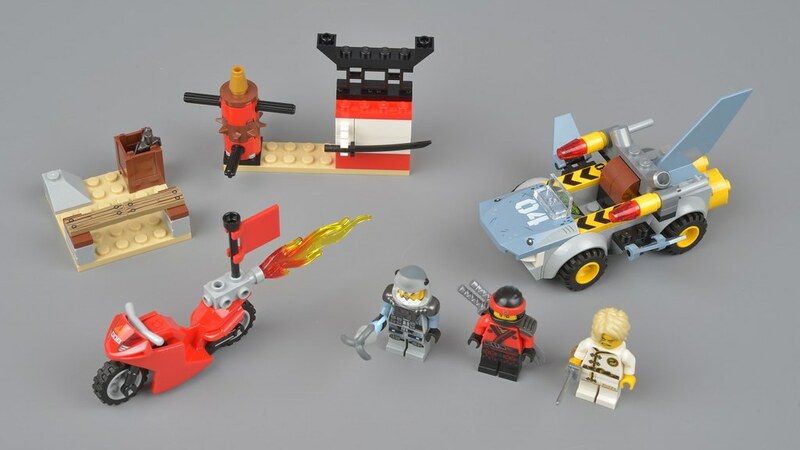 I would have liked to see Kai's firey hairpiece included as well, to accompany Lloyd's, but what is here is sufficient enough and the hairpiece can still be acquired quite cheaply through his Kendo Collectable Minifigure. Garmadon's evil army in the film consists entirely of sea creature warriors for some reason, and the Great White is one of the most common units fighting for the warlord's conquering goals. 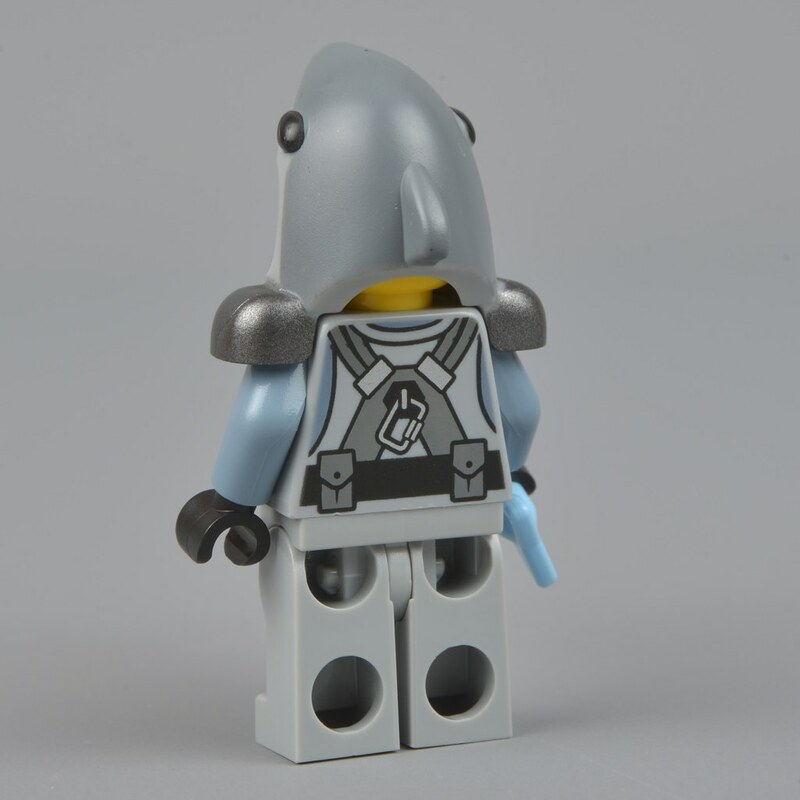 As the name describes, the minifigure's outfit resembles a Great White Shark and in that regard it succeeds spectacularly, with dark and light grey on the shark head helmet. Unfortunately, the shoulder armor is molded into the helmet but it still looks superb, with a titanium metallic silver color and printed battery life bar which appears to be running out. The rest of the body is grey in color but includes sand blue, dark grey and silver details - along with a splash of orange on the chest. The arms are also sand blue, and the black hands are equipped with a harpoon attached to the mouth of a light royal blue fish - exclusive to the LEGO NINJAGO Movie line. The first model built is an eleven-piece motorcycle for Kai. It is nice enough, but I would have preferred something brick-built rather than pre-molded. 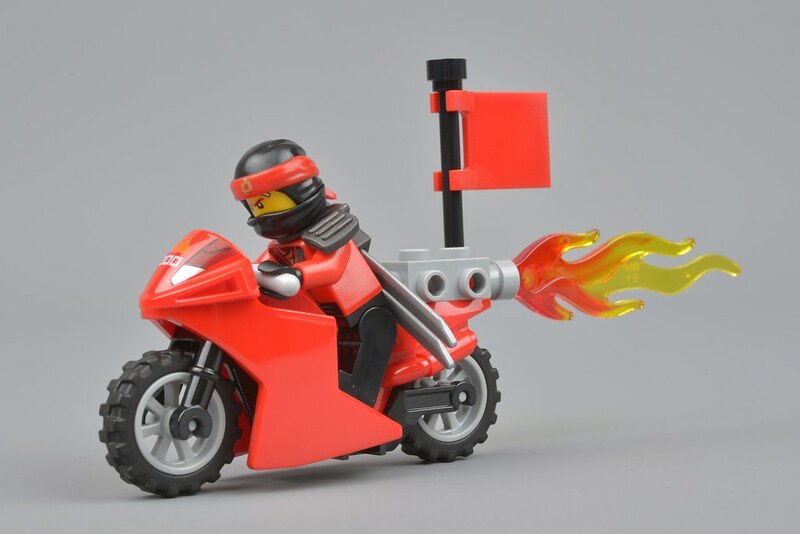 I'd imagine a similar size to Kai's cycle in 70600 Ninja Bike Chase could have replaced this, but have a feeling that the minimally-built cycle was favored for specific reasons related to the Juniors line. Kai's motorcycle is opposed by the Great White riding a 'shark car'. 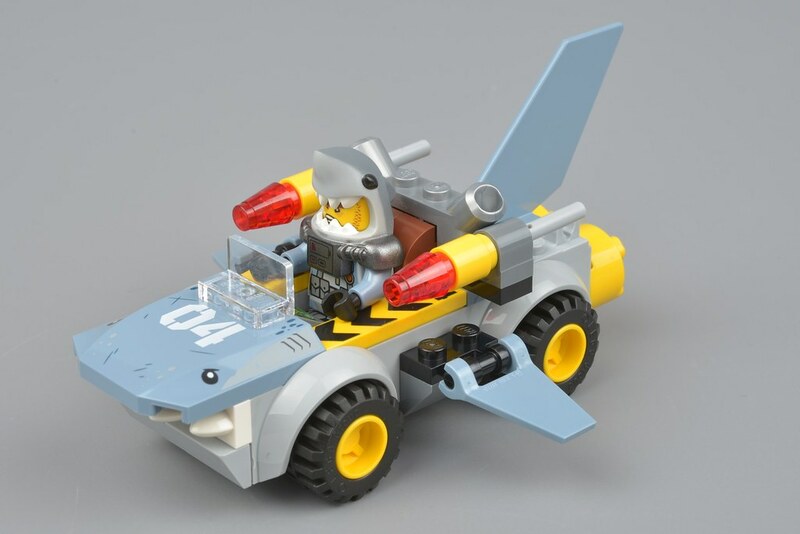 This is the best model of the set in my opinion, as it offers considerable play value and is a perfect vehicle to complement other Shark Army transport, such as 70609 Manta Ray Bomber and 70610 Flying Jelly Sub. I should point out that the chassis is entirely pre-molded. I don't mind it, as it saves building for a set made for younger kids - however, it probably brought the price up at least a little bit more than it would have being brick-built. The car's color scheme matches the rest of the army's - with grey, sand blue and yellow. Its general appearance happens to look both cute and ferocious at the same time, with simple eye printing and Mixels teeth sticking out from underneath the hood. What I assume is an identification number of sorts appears on the hood, labeled '04'. Hazard stripes run alongside both sides of the driver's seat, and it is complete with three fins and a dreaded pair of flick-fire missiles. A clip is situated at the very back to store away the fish harpoon. Additional features include a windscreen at the front and exhaust in the back. Next comes the two dojo sections. The first is a small one on a 6x6 tan plate, with a crate of two sais and a training block adjacent. The idea is to slice the two 1x3 printed wood tiles in half with the sword. This is a simple feature and works well with the way the model is built. Two grey 1x2 masonry bricks are included here, which could be useful. The final built section is a weapons rack with wall, fencing and a spinning dummy nearby. I like the color scheme of this area, and the dummy works simply by rotating it on a turntable. The brown 2x2 circular brick, with spikes around the diameter, is exclusive to this set, though the mold itself was introduced in NEXO Knights earlier this year in purple, medium blue and orange. The wall features space to clip a black katana and another weapon of your choosing. Atop it is a brand-new, oriental 1x4 fence piece, which looks brilliant. Right now it is exclusive to this set and 70620 NINJAGO City. This set is simply okay. While the models together look good, separate they lack detail and are too little involved to be worth the purchase. However, the parts selection is good and the price is low, though the 18.5 cents per piece is definitely off-putting. I guess larger, specialized parts are to blame, like the motorcycle and car chassis. 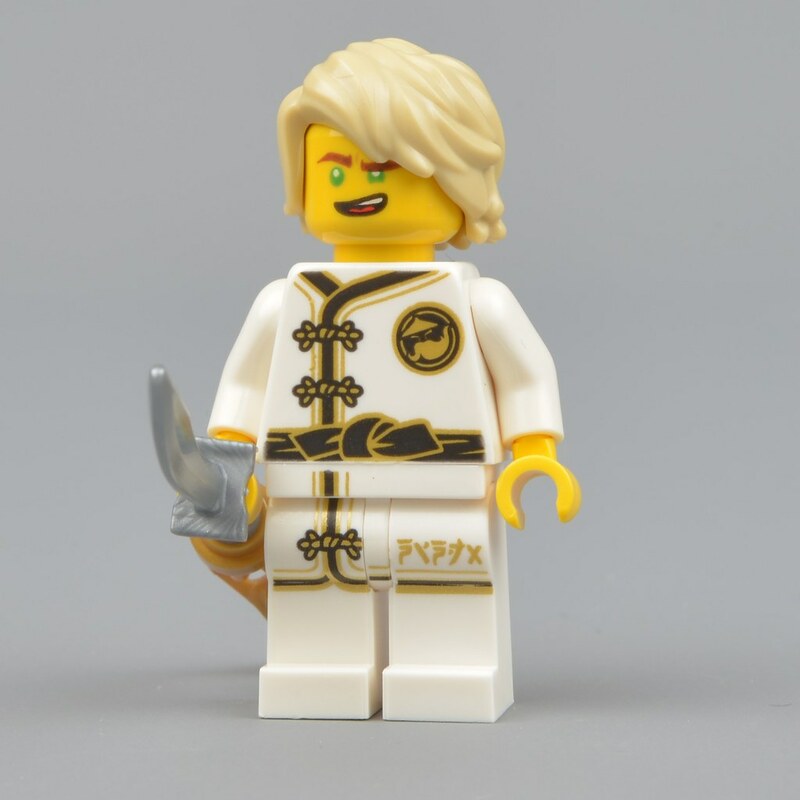 However, the minifigure selection is good - though two can be found in other (better) sets, and Lloyd can be recreated by combining his head and hair with Spinjitzu Training Nya. I also admire the variety of pieces included. Therefore, I conclude that this set is perfect for young children who wish not to touch the main product line yet (as Juniors is intended for), but for older fans looking to expand their parts collection and minifigures easily, it is honestly a matter of preference. A slight discount is preferable either way, but even then it is not difficult at all to recommend equally-priced 70607 NINJAGO City Chase over 10739! I hope you have found this review informative. Let us know by liking this article and share your thoughts on the set in the comments below. Thanks to Huw for the photos. Do you have a review of Nijago City planned? Nice review. I've heard Spinjitzu Training Lloyd would be available on a magazine dedicated to the movie soon, at least in Europe. Dunno when it comes. @alijoezac I think so, it'll probably release a few days after the movie (seems to be appropriate date at least). At £16, it seems to me this is one of the few Ninjago Movie sets that DOES offer value for money, in the UK at least! I hope everyone enjoys the movie when it goes into general release later this week! Might be interesting for someone with kids to review the set. ;) or someone who understands what the point of junior sets is. As far as I know junior sets are supposed to be super easy to build and always have pre-built chasis. It's like the whole point. Also no super small (and hard to handle) pieces. Without single stud plates and other microscopic bits, the ppp will be more. It is just expected. Cool figs. Will I get it? Not unless my five year old starts mowing lawns and buys it himself. Even then, I would tell him to wait until it is 30% off or more which doesn't seem to happen much with Juniors sets. Besides, I gotta save money for a Falcon, unless I change my mind. Which could happen...after counseling. I don't want to read a review of the movie I want to see the movie! @Jumbo Bricks Blue Then do so! ;-) It's out Friday (for those of us in the US). ^ in case UK viewers are wondering when the film comes out, it's 2 weeks later than the US release (perhaps some kind of holiday period targeting going on). I've seen a trailer today on tv but it made the film look a little like a 'trashy kids film'. I'd imagine the film is much better than that but the editing of the trailer was just odd. I might consider this juniors set to aim to complete the dojo collection of ninja, though there are a lot of interesting parts and prints mixed in. I could see that Skark car employed as a little staff car around Garmadon's base; you know, for delivering coffee and documents to shark generals and what not. The best thing about Juniors sets is that there are no stickers allowed.
" the low price point of $19.99 or 19.99€" - would be nice to include the GBP price as well. Agree with SweSarah, I really think you missed the point of the set. It's for Juniors, and it seems silly to me to mention things like price per part and the use of large pieces as negatives, when actually the latter is a positive for the target audience. 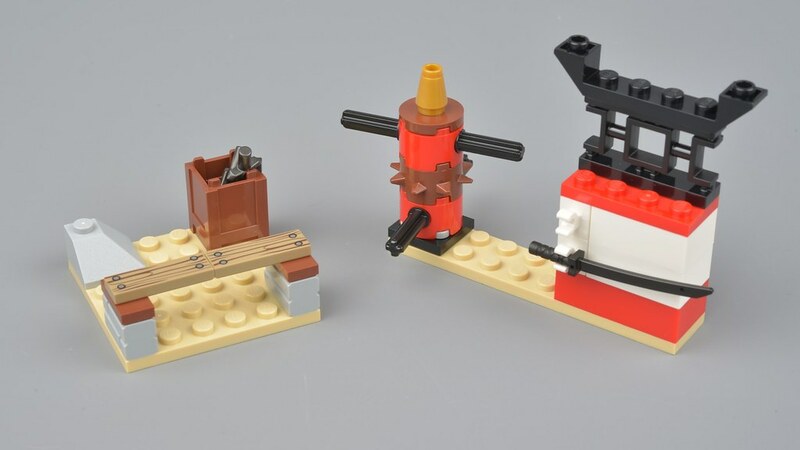 I know most Brickset users are adults and essentially we are not the target market for the majority of LEGO's offerings but for Juniors sets you really can't apply AFOL standards when reviewing. ^ I don't see what the problem is, and I definitely didn't miss the point as I know very will it is not part of the normal range. I thought I made it clear that this is perfect for the target demographic, while AFOLs should probably look elsewhere. ^ *very well - I need a proofreader. Gosh darn, timed edit-locking! As an AFOL I might consider this set when the price drops a bit. Never had my hands on one of those racing bikes yet and some of the parts are great. Can't wait to visit ToysRUs for the Ninjago "Make and Take" event on Sat. w/my daughter and then on to the movie afterwards together. Also can't believe I'm looking forward to a Ninjago movie weekend LOL! @TheBrickPal I have long been aware of the release date. (One week after my birthday). I was merely voicing a view that may be shared by others. ^ I never said you didn't know. :-) I'm just saying, there's (y)our chance! I definitely want to see it too. And it's out a week and a day after my birthday! @TheBrickPal: Well a happy belated birthday to you! Here's hoping that the movie will be the perfect late way to celebrate! This is my theory concerning the rocket bike: at some point in the film, garmadon's army overpower and destroy the fire mech. Kai uses the bike to escape and then builds something new.